Greek Style Pasta Salad for Two! I love pasta salads and I make them often. Especially during the summer. Well, this weekend, I wanted some of my Greek style pasta salad, but didn’t want to make a whole batch. I ended up re-working the recipe to make a smaller batch and now, I am sharing it with you. It’s my Greek Style Pasta Salad for Two! Toss all of your other ingredients into a medium bowl. Once the pasta is cooked, strain it and add it right to the bowl. Mix it all together and serve it up with a little extra feta on top. You can also salt and pepper to taste, but I have never needed to with this recipe. You can eat it right away or eat part of it and save the rest. It refrigerates awesomely and tastes just as good cold! 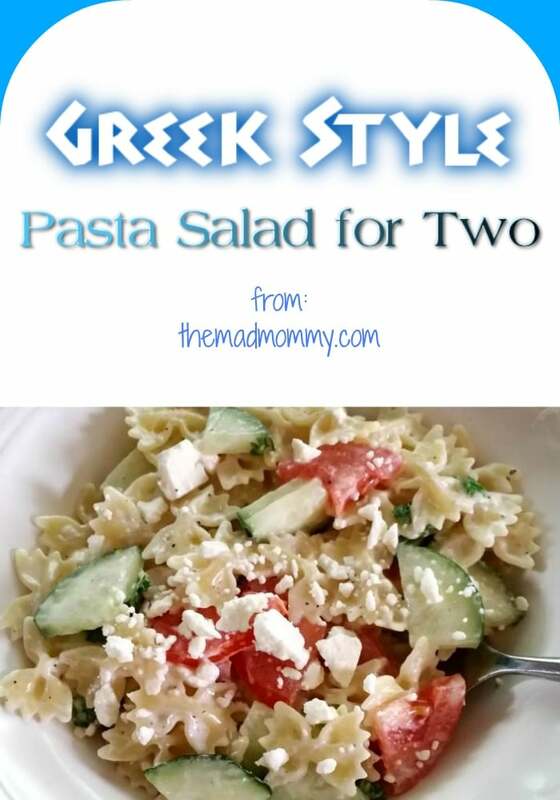 I hope you enjoy this quick and easy Greek Style Pasta Salad for Two. 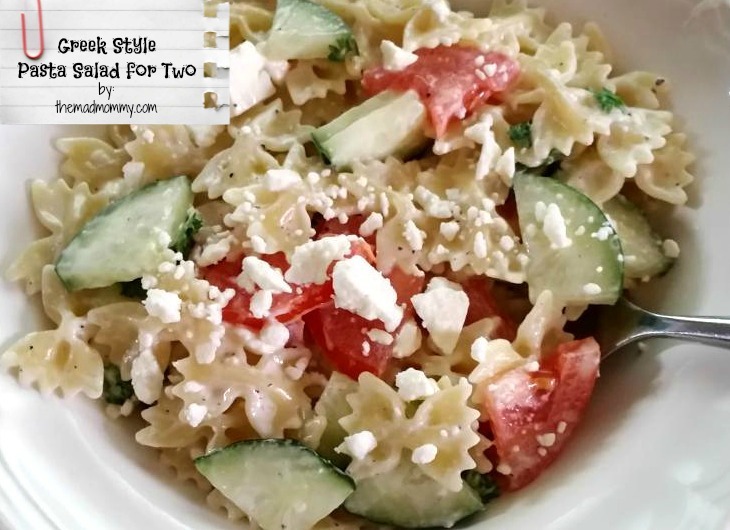 Greek Style Pasta Salad for Two! A quick and easy #recipe that is always delicious! Do you love pasta salad? Love! I love Greek food. I love Greek salads and so love feta. Yum! Easy, tasty, and healthy? Sounds like the perfect recipe for me. Thanks so much for sharing this. It looks delicious! This looks so delicious! I want to make it now! When it comes to food, I love Greek anything. I love Greek salads and pasta so I bet I would love this dish as well. Thanks for sharing. That sounds so good. My hubby and I love things like this to have on the side with our burgers or bbq chicken! NOM. MOUTHING.WATERING. I’m obsessed with Greek food, or anything with feta on it, really lol. This looks amazing and so simple to make too! AMAZING! I’m obsessed with everything that is greek, aka feta cheese! Thanks for this! Bow tie pasta tops any other kind of pasta in my mind. So good. I love adding feta to everything too. Maybe in my past life I was from Greece. ha! PAsta salad is one of those foods that is very dangerous for me to be around. It is so darn tempting every time! Mmmmm, looks like a very tasty salad. My entire family would enjoy that salad. Thank you for sharing. This would be a delicious meal for me! Fresh cucumber and tomato sound so good with feta cheese and pasta! I’m obsessed with pasta salad but I hate feta! I’d just put a different cheese in mine and call it a joyous day. This is such a an amazing recipe, nothing better than pasta with some feta cheese! Oh how delicious does this look. I could do with a bowl of this right now, I’m loving the Greek style take on the pasta dish. My husband would LOVE this but we can’t have dairy. Pinning though because this is awesome! I make a similar one… it’s so good! Anything we feta cheese is a win in my book!!! I think I just found what I’m making for lunch today. Now I’m off to the grocery store! I love Greek food. I would make this for my family for sure, looks great. Omg this sounds delicious! Im always looking for new salad recipes! yum! I love pretty much anything with feta cheese and olives!! I would eat this all by myself… in one sitting… yum! I love the look of that salad. I adore pasta in salads too – and I wish I had this for my dinner instead of my sandwich! I absolutely love pasta salads . This one looks so delicious. I am going to have to make this for my husband and I during the week. Definitely bookmarking this post because I love Greek Salad, and funny thing is I don’t have a recipe for it yet. So thank you so much for sharing! 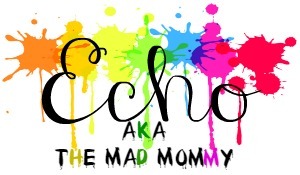 I will definitely be trying this recipe Echo 🙂 Thanks for linking up to Pin Worthy Wednesday, I have pinned your post to the Pin Worthy Wednesday Pinterest Board. Yum! I have all these ingredients in either my pantry or fridge right now. Guess what’s for dinner at my house tonight? I love pasta salad and this recipe sounds really good. I am going to make this for the kids and I.
this looks so delicious! I eat pastas and salads all the time, will try this! Great recipe. Easy and delicious! Thanks so much for sharing it with all of our Let’s Get Real readers. I love the salty goodness of feta. My mother makes a version of this and it is so good! yum, yum, yum! this looks so tasty! Anything with feta is good in my book. perfect ! bookmarking this , I think hubby will love it . I love pasta in any shape of form and I also love Greek salads which I get locally. The combination must be delicious. I’ll have some please. I love pasta salad, and when it is Greek styled it is so much better. Ths looks like an excellent recipe and i will have to try it this weekend. Sometimes we like to try things different, this looks great!!! Pinned to our Friday Feature board. Looks tasty – A great side dish for a giant Gyro IMO. Fast, simple and tasty, hard to beat that combo. This is a great option. I love greek food as it’s always flavorful. I’ll def add this to my list of recipes to try. Thanks. I love a pasta salad and your Greek style Pasta Salad looks awesome! Hope you are having a great week and thanks so much for sharing your post with Full Plate Thursday.